Do you know that you may be asked for giving biometrics with your visa application? See our great photos from previous years. Our Summer English in Canada program is an English immersion experience that combines ESL classes with special university-level courses. Mornings - you will take English language classes (ESL Communication) from 9:00 to 12:15 focused on reading, writing, listening and speaking skills. Afternoons - you will take an elective course from 1:30 to 4:00. Evenings - Time for parks, beaches, historic sites, summer festivals, events, shopping and nightlife, too! On weekends - Enjoy organized day trips to natural attractions, historic and cultural sites in different regions of Nova Scotia. You will stay right on campus in one of the university residences. English-speaking Canadian language assistants live with you in residence for conversation practice and to provide you with information and organize activities. You will have the opportunity to speak English every day in class, around the city, and at home in residence. Click here to read more about Dalhousie University and Halifax, Canada. Please note the fee does not include international travel and incidental expenses. 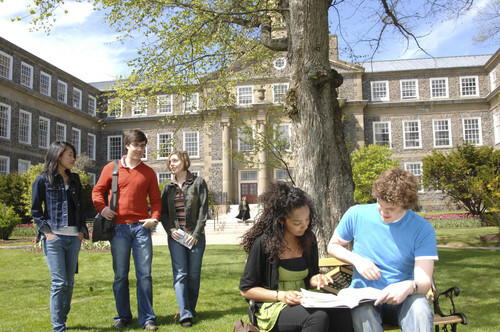 Academic courses associated with the Summer in English program are unique and are not directly equivalent to Dalhousie University credit courses. However, all students will receive a certificate upon successful completion which you may present to your university or future employer. Pick the ESL program that best for you from below. Use the language skills you have learned in your morning English language class, in real-life situations in the community. This course focuses on understanding Canadian culture. May 13 - June 07, 2019 Halifax, Nova Scotia Register Now! June 17 - July 12, 2019 Halifax, Nova Scotia Register Now! July 22 - August 16, 2019 Halifax, Nova Scotia Register Now! Learn key web concepts and skills for creating and maintaining websites. Additional topics include hypertext markup languages, style sheets, client-side programming, multimedia foundations and dynamic content management. Explore marine life and habitats found along the shores of Nova Scotia. Field trips will take you to sandy beaches, rocky shores, tidal mudflats. Includes an offshore boat trip to see whales and seals. Examine chronic diseases that impact the growing cost of health care. Learn inter-professional approaches to practice and care, emerging models of chronic care and intervention strategies. Explore topics related to the environment, sustainability and society. Topics include energy use, water and air pollution, climate change and world population pressures. Improve the skills you will need for the international workplace. The focus is on written and oral skills for employment. Learn about the natural and man-made landscapes of Nova Scotia. Module themes include sustainable development, environmental and ecological impacts, and identification of plants and their value on the landscape. July 22 - August 16, 2019 Truro, Nova Scotia Register Now! Explore the application of engineering principles to problems related to the built environment, the natural environment and natural resources, and how changing technology affects engineering. Improve your ability to teach the English language or to teach other subjects through the medium of English. This course is designed for experienced teachers at the elementary, secondary and post-secondary level.